We've been spending a lot of quality time with Nintendo's new 2DS console, and one of the first questions people have about the machine is how the battery life shapes up when compared to the 3DS and 3DS XL. Family Gamer's Andy Robertson will be answering that question in more detail as part of his Parent Trap blog on this very site, but for the time being you might like to know that the 2DS comes equipped with a 1300mAh battery — the exact same size as the one which shipped with the original 3DS model. That means the console will offer roughly the same battery life as the original 3DS with the 3D slider switched to "off". So now you know. Carry on. Wasn't it already confirmed that it'd have roughly the same battery life as the original model? Either way, the complete exclusion of 3D and the "single screen" should have some effect on the battery life. At least I would imagine it would. OH! *forgot about the MONO sound. That should factor into it as well. Now open it up so we can see that reported single screen inside. @b_willers And touch the top screen too. I imagine with some tech developments it will have a longer battery life than the original. Then; conduct the "flight of stairs" test. Where upon it is dropped down a flight of stairs. My original 3DS battery lasts for a pretty good amount of time with 3D off and power saving mode on. @orravan85 - "OH! *forgot about the MONO sound. That should factor into it as well." Surely driving the single screen it uses will use less power. No stereoscopic vision - no stereo sound! But seriously, mono sound isn't really a big energy saver compared to stereo. And everybody uses headphones anyway. Lame! I expected a better battery! Is this really a surprise? We already know the 2DS is a budget production, and by using the same battery as the 3DS, which they already have, they save even more money. Meh it's Nintendo. They'll cheap out as much as they possibly can. Perhaps they'll try to increase profits later by selling higher capacity batteries that would still fit in the original slot and back case. Battery tech has been getting better. I've seen a Chinese bluetooth game controller smaller than the 3DS that packs a 2000 mAh battery. Thats nice to hear. I might get a 2ds as soon as possible. @rjejr I had no idea that people in this day and age would still know what mono was, much less replicate it! Seriously though, are they gonna ship out with those old single ear "mono-buds" from the 70's? Stereo would not have hurt... In fact I would have considered one for myself... Maybe. Mono isn't a big deal, I'm not the target market but I pretty much always use headphones for better sound anyway. Meh well I guess that's okay even with the battery off my 3DS didn't last that long. I think that some 3 to 5 year olds(TARGET GROUP) or so might enjoy this but the folks who like BETTER not cheaper... will find this a bust. Can I have a cookie for my detective work Damien? I am still waiting on a 3DS Lite that has over 2 times the battery life of the originla and isn't freaking ginormous either. I'm not big on the XLs. The worst thing about 3DS is its mediocre battery life. Wait,this is like the XBox names,360 to 1? 3D to 2D? Wierd,huge down hill. They may cheap out but still their consoles are made to last. And regarding the single speaker, it is indeed better to use headphones. I tried them when playing Dark Moon and I never looked back. @rjejr mono sound is all the iPad and iPhone have, both get atrocious battery life in game but are advertised for how long the battery lasts playing music through headphones. I know because I currently have an iPad and had an iPhone not long ago. The owners of these rediculously priced devices complain that Nintendo isn't porting games to their devices because app gaming isn't quite as fun as the 3DS. @Koto I'm sure there is some cost savings involved, but higher capacity batteries also add extra weight. The Wii U Pro controller lasts longer than the 360 controller but also weighs more. When producing a handheld largely to be used by kids weight is also a factor because of the combined weight of other components (gyroscopes, accelerometer, screens, motherboard, speaker, cameras, joysticks, battery) inside. @Nico07 I didnt know the iPad was mono, and people pay $500 for it still? I knew about theiPhone, I had a iTouch 4 for a year before I traded it infor a Tab 2 7". 2 speakers on the bottom, $200. I dont really think it matters if its stereo or mono, but 2 speakers woild sound better than 1. Even the Gamepad has stereo speakers and thats technically just a controller. It wouldn't add that much more. I don't find the Pro controller any heavier. Vita has a bigger battery than the 3DS but it doesn't feel much heavier. PHONES have much bigger batteries than the 3DS but don't feel much heavier in use anyway, even if they are slightly heavier. @rjejr I agree two speakers do sound better but I assume Apple owners who care use headphones. @Koto Maybe you underestimate your own strength. Lol, not at all. I've gotten much weaker over the last couple years. 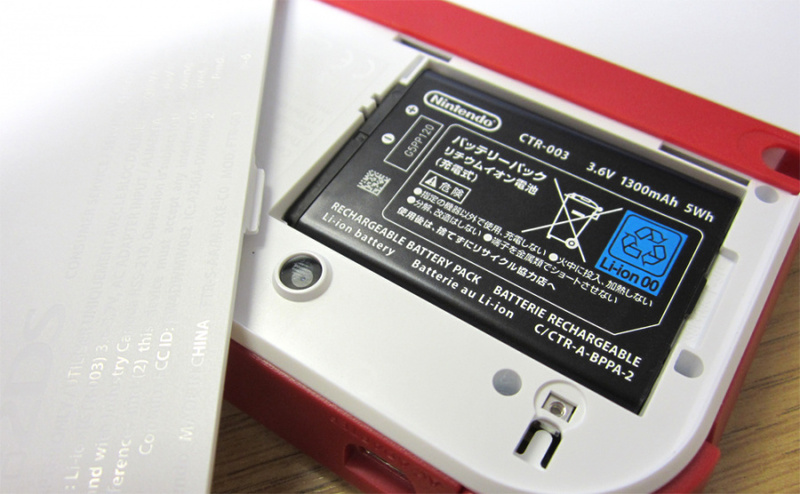 Nintendo's just cutting costs, and hoping that people will get used to 2-5 hour battery life. @sinalefa Nintendo's consoles used to be made to last. Circle Pad's wear out far too quickly. I had to have one replaced after only 3 months. I'm very dissapointed! They screw up on the battery on the original 3ds, then have to release the xl with bigger battery and now they release another iteration of the console and screw up on the battery once again! What are you thinking Nintendo, get a grip. either im stupid or i dont see how this is really news? i just thought this was obvious they would use the same battery as its about the same size as the original 3ds so why would they suddenly come up with a new one and not to mention this handheld is about saving money so duh? @unrandomsam I've always felt that the Circle Pad feels really good quality. No offence intended but you must have been really rough with yours for it to wear out in 3 months!